Save Marinwood-Lucas Valley - our community, our future: You earn too much. You need to "Contribute" more to your local government"
You earn too much. 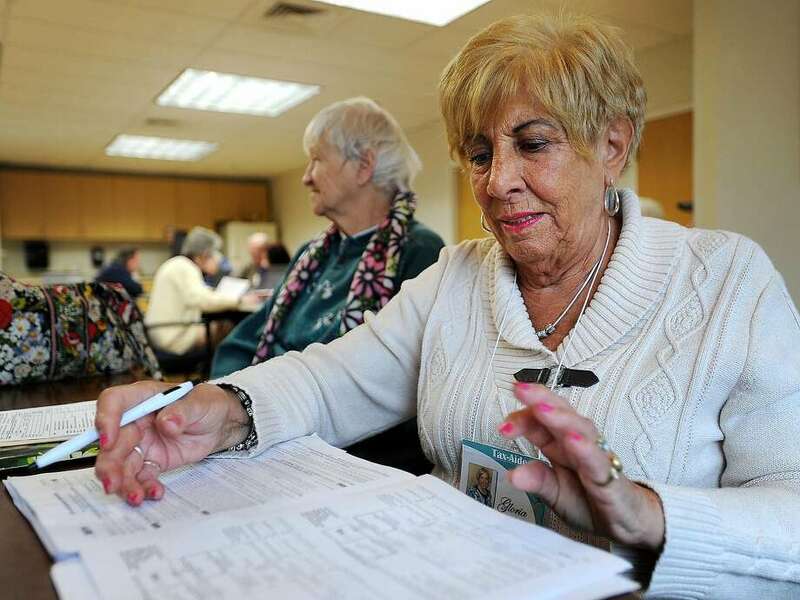 You need to "Contribute" more to your local government"
Volunteer Gloria Lanna, of Milford, reviews tax returns before filing at the AARP's Tax Aid Program at the Milford Senior Center in Milford, Conn. on Tuesday, March 7, 2017. Seniors and low income residents can have their taxes done for free on Tuesday and Thursday mornings from 9 am until noon. Lanna said that volunteers are able to complete about thirty returns per session at the Milford location. As President Trump and his allies in Congress work to cut federal taxes and spending, San Francisco’s elected officials are laying plans to create new taxes at the state and local levels. The Board of Supervisors plans to vote next week on a resolution urging the California Legislature to amend state law to allow cities and other local governments to impose personal and corporate income taxes. The resolution says the city needs to explore “progressive” new revenue sources because the Trump administration has threatened to withdraw federal funds from sanctuary cities and is working to overturn the Affordable Care Act, which could increase the city’s cost of providing health services. At the state level, Sen. Scott Wiener, D-San Francisco, has introduced a ballot measure that would create a California estate tax, but only if Trump and congressional Republicans carry out their vow to kill the federal estate tax. In 2015, the federal estate tax brought in $17.1 billion, of which $4.5 billion or 26 percent came from California, even though California accounts for only 12 percent of the U.S. population. The proposed California estate tax would have the same rates and rules as the federal one, but the billions it raises would go to California instead of federal coffers, Wiener said. That federal tax applies to the portion of an estate that exceeds roughly $5.5 million per person. The rate tops out at 40 percent. In 2015, it applied to just under 5,000 estates, including 975 in California. Both new tax proposals face an uphill battle. Only 14 states let local governments impose income taxes, and only 14 states and the District of Columbia levy state estate taxes, according to the Tax Foundation. California has never allowed local income taxes. In 1963, amid rumblings to enact them, the Legislature passed a law forbidding them. To begin imposing them, the Legislature would have to amend that law and the governor would have to approve it. Then, a city or county would have to get local voters to approve the tax, said Michael Coleman, who runs CaliforniaCityFinance.com. In 2003, then-state Assemblyman Mark Leno introduced a bill that would have authorized any California city or county that formed a fire protection agency to levy a local income tax, if that tax was approved by voters. The bill died in committee, Coleman said. Last year, Los Angeles County supervisors voted to lobby for state legislation that would let them impose a local tax on personal incomes over $1 million to pay for homeless projects. Gov. Jerry Brown said he would not support it and the effort died. Supervisor Aaron Peskin, the San Francisco resolution’s main sponsor, said it has the six votes needed to pass next week. Peskin and Assemblyman Phil Ting, D-San Francisco, are working on legislation that would let San Francisco alone pursue a local income tax, Ting said. Peskin said that $1.2 billion of the city’s $9.6 billion budget comes from the federal government. In January, Trump signed an executive order that said “sanctuary” jurisdictions that don’t comply with certain immigration laws “are not eligible to receive federal grants.” It’s unclear what federal grants Trump meant or whether the order is constitutional. Even if it’s not, the city should be exploring “all mechanisms and tools” to fund its transportation and homelessness needs, Peskin said. Although he is not proposing a specific tax rate, Peskin said the city controller estimated that a 0.5 percent city tax on incomes above $1 million would raise about $80 million a year. “Right now (an income tax) is not even on the menu of options. It should be on the menu. How we would cook it remains to be seen,” Peskin said. David Kline, spokesman for the California Taxpayers Association, called local income taxes a “bad idea.” California’s top state income tax rate, 13.3 percent, is already the highest in the nation. “Adding local taxes to the mix would make us less competitive and would be a nightmare to administer,” Kline said. If you worked in more than one city, you might have to prove where you earned every dollar, he said. It would also be a “major detriment” for cities competing to host an athletic event, like the America’s Cup or Super Bowl, because visiting athletes would have to pay state and local income tax on money earned there, Kline said. His association also opposes a state estate tax. “You earn income, you pay income tax. You buy a car, you pay tax every year to drive it. You buy gasoline, you pay gas tax. You buy a house, you pay property tax every year. When you die, everything that has already been taxed, now they want to tax it again,” he said. California had an inheritance tax, similar to an estate tax, from 1893, until 64 percent of state voters approved a ballot measure to repeal it 1982. The repeal, which also prevented future estate taxes, had bipartisan support, Kline said. Wiener’s measure would overturn that ban, with voter approval. Wiener expects there would be less opposition to an estate tax now than in 1982 because it affects far fewer people. “It is one of the most progressive forms of taxation,” he said. In 2001, all 50 states had estate taxes, said Nicole Kaeding, an economist with the Tax Foundation. But “they are incredibly complex to administer. They produce very little revenue. Most states decided it wasn’t worth the cost,” she said. The 14 states that still have the tax rely on the Internal Revenue Service to audit estates and do the heavy administrative lifting. “If the IRS decides an estate is worth $10 million, the state says, ‘Here is our tax rate on that $10 million,’” she said. If the federal estate tax dies, she predicts those 14 states will also abandon theirs because the IRS won’t be there to help. The “rhetoric that surrounds the estate tax,” that it “breaks up dynastic wealth,” is overstated, she said, because the uber-wealthy use sophisticated strategies to minimize it. “Who really pays are small farms and business owners” who are marginally over the exemption amount. Kaeding said most cities and states are trying to understand how federal tax and spending plans will affect them before proposing new taxes. Most states piggyback on federal taxes. The Trump and House Republican plans would cut tax rates and broaden the tax base by cutting back deductions and credits. “If you increase the base, but state tax rates don’t change, states would see an increase in revenues from federal tax reform as currently structured,” she said. However, states may need that money to offset proposed cuts in federal funding for health care and other programs.